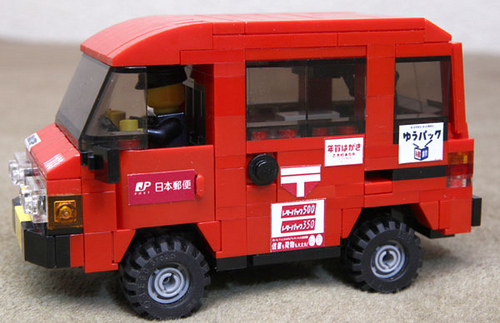 Someone mentioned during the FBTB+TBB panel at BrickCon on Sunday that they missed the Japanese-focused LEGO models we used to feature, so I was very glad to run across this adorable little van by 1103spa (whose blog features some pretty cool Antarctic vehicles, too). Let me raise my hand as another who misses Pan-Pacific Bricks. As is probably obvious, my personal philosophy of LEGO blogs leans to niche blogs. That way, someone with a particular interest in say, robotics could start a NXT blog, or a train guy could do a train blog, and they’ll bring a lot of focus and expertise when commenting on that topic. Also, niche blogs like those above might attract non-AFOL readers who are interested in robotics or trains, but who might not read an all-things-LEGO blog that occasionally has robots or trains. In the case of PPB, I particularly liked how it helped bridge the cultural divide when there are Asian MOCs out there on Brickshelf or Flickr but where I don’t know the context. Also, with the fact that you published in both English and Japanese, it helped bring together two segments of the AFOL community that sometimes don’t communicate. That said, don’t get me wrong. I love the fact that there’s such a thing as the Brothers-Brick, which has become the one-stop-shop that all AFOLs check out. Since Lugnet is pretty much dormant, and Brickshelf is no longer the only place we post images, and since Flickr is diluted by all of that pesky non-LEGO content, the BB has become our only real common destination to check before we go off to all of our disparate forums, blogs, Flickr groups, etc. So, while I understand that you’d like to see more Japanese MOCs here on TBB, it’s a bit unfair to suggest that merging PPB into TBB is what has caused the lack of frequent posts about Japanese MOCs and events. In fact, it’s the other way around; as early as late 2006 when we set up TBB here on Brothers-Brick.com, there was already a downturn in LEGO interest among Japanese AFOLs who were online. I don’t have visibility into the offline Japanese AFOL world, but I can only feature what I can see.